Democrats Abroad South Africa (DAZA) is alive in Cape Town! 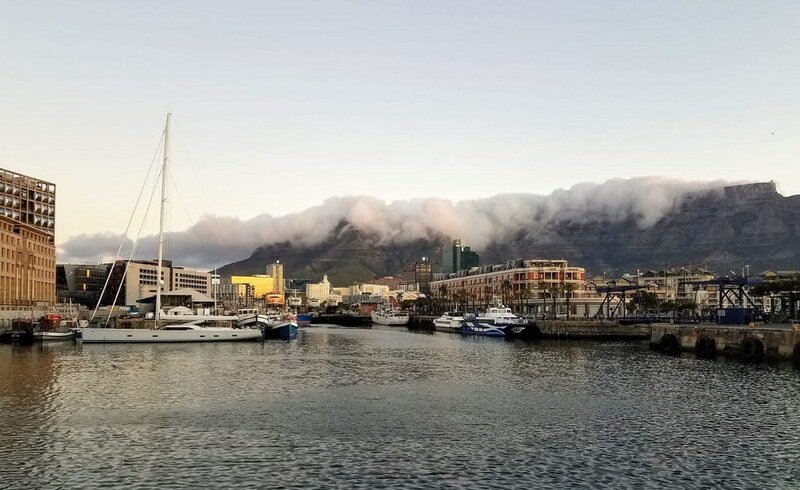 An informal group of Americans gathered over coffee on a beautiful Wednesday afternoon on the V&A Waterfront, under the gaze of Table Mountain, to chat about the American situation. DAZA Cape Town is back! Frustrated watching political scandals from afar, concerned men and women expressed their thoughts and feelings about needing to be heard and share with like-minded friends. We discussed the possibilities and methods to vote from South Africa, where Americans may be located, and how to find them to let them know they can vote. There was discussion of parties and events, perhaps in collaboration with one of the local universities! The group in Cape Town will organize informal gatherings for people who are interested to share ideas and discuss ways to get people registered, and ultimately to vote. DAZA Cape Town will advise prospective voters about the VoteFromAbroad.org website in time for them to cast their ballots next year. We will be able to answer queries about state-specific voting regulations and engage in the polls, from the primaries to the crucial November 2020 election. A platform for Americans in Cape Town has been established. Are you interested in joining this group of Americans dedicated to positive change? Will you attend a gathering in Cape Town (or Joburg)? As your Executive Committee planned for 2018, we knew that Democrats Abroad would put an unprecedented effort into the 2018 midterms -- it was already clear that American values were at stake. As remarkable Democratic candidates emerged all over the USA, we found enthusiasm from Americans all over Luxembourg. Our in-person support for voters went later than ever, with our final voter pavilion on the Grand Rue on October 21st. We helped dozens of Americans request or return their absentee ballots at "the last minute." In fact, our volunteers kept helping voters worldwide by phonebanking and advising voters through today! 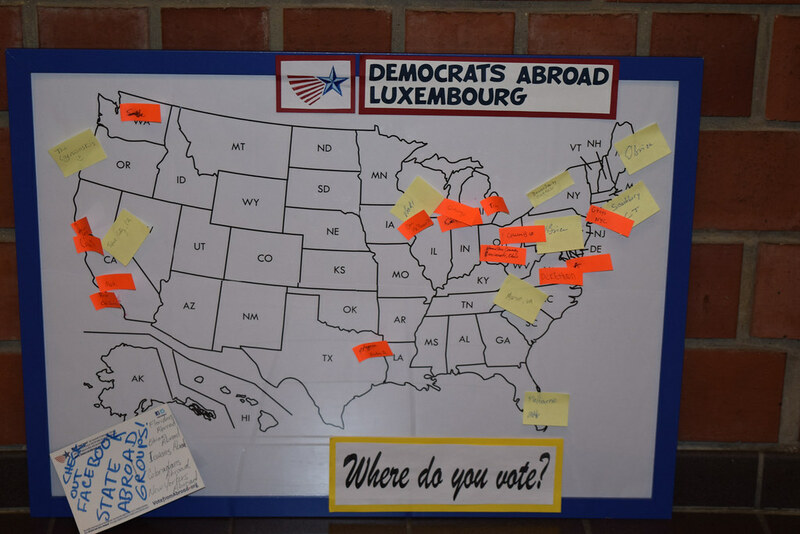 Democrats Abroad Luxembourg reached more than 100 Americans living in Luxembourg in early September, with three voter-oriented events over four days. 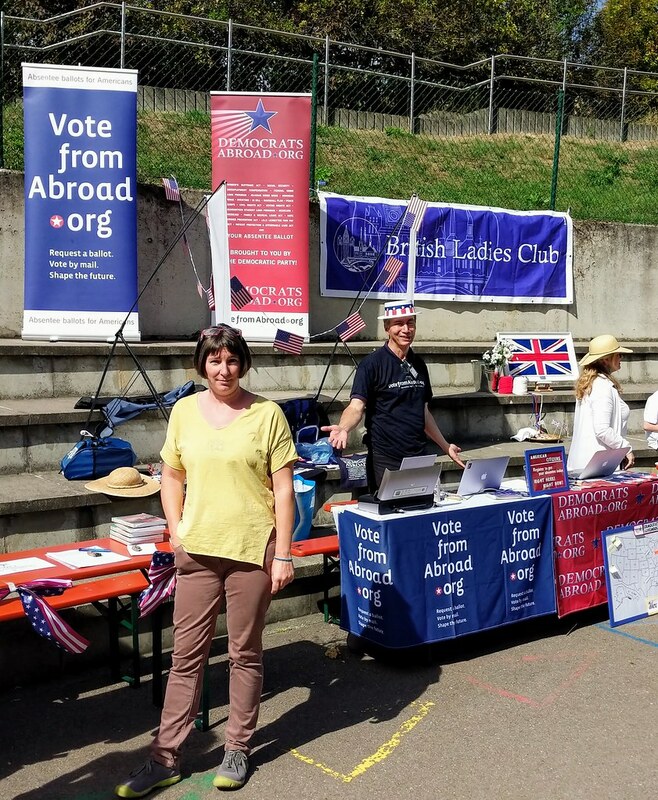 First up was the Welcome Back festival at ISL, where super-volunteer Mark gave non-partisan support for voters requesting their ballots for the midterms while Executive Committee members Natalie and Will talked about Democrats Abroad. Our well-attended Second Tuesday gathering was another chance to help members and newcomers request their ballots. Our battery-powered printer -- generously provided by the donations of our members -- let us create the forms while we enjoyed the warm evening on Bosso's terrace. On Wednesday, Mark and Will helped dozens of American students spending their fall semester in Luxembourg. The students had some complicated questions about what address to use and how to return their ballots. We were well-prepared by the global Study Abroad and global GOTV teams! Democrats Abroad Luxembourg is very proud to announce that we are promoting and supporting a local March for Science coordinated with hundreds of other marches and events all over the United States and the world. On April 22, we will stand together with millions around the world to say that the common good of humanity depends on defending critical thinking and the free exchange of ideas. The global Women's March organization has designated this an official successor to their own marches in January. Please spread the word (and social media links) among friends and family -- American or not -- and scientists and women and anyone else who wants a better world. Watch your email for DA-specific events to make placards and posters the week before the march. If you'd like to volunteer to support the march or you know a group that would like to participate, please contact the main organization. The members of Democrats Abroad Luxembourg elected officers and other leadership positions at our Annual General Meeting on 14 March 2017. 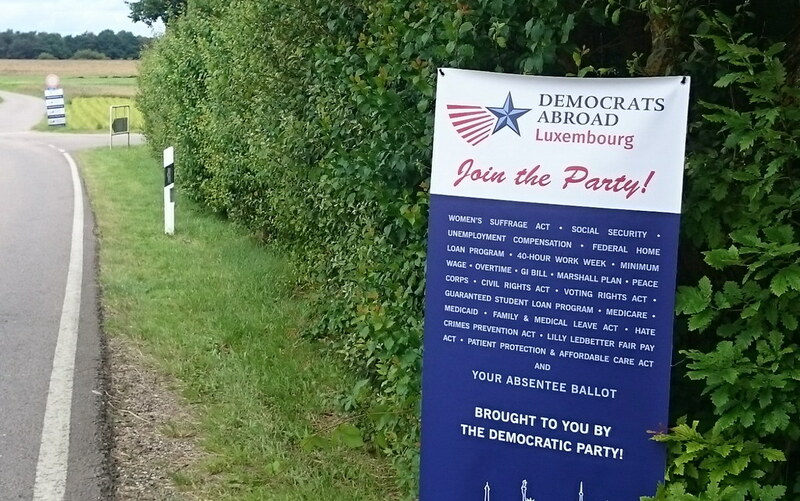 The new Executive Committee is responsible for the work of the U.S. Democratic Party in Luxembourg, for enhancing the voices of its members in U.S. politics, and for advocating on issues of concern to Americans living abroad. Members of Democrats Abroad Luxembourg are invited to join our private potluck on January 20th to celebrate the achievements and spirit of President Obama's legacy. If you'd like to make a more public statement, there are several women's marches and vigils organized near Luxembourg. That includes vigils in Liège and Brussels on Friday night and marches in Strasbourg, Frankfurt, and Heidelberg on Saturday. DA-Luxembourg’s Voter Pavilion on the Grand Rue on June 22, the eve of Luxembourg’s National Day, is a biennial tradition. All day, our volunteers helped American citizens request their absentee ballots using www.VoteFromAbroad.org and answered questions of all kinds about the American political process. On Super Tuesday (March 1) and Second Tuesday (March 8), American citizens in Luxembourg lined up to cast ballots in the Global Presidential Primary and help determine the Democratic nominee for US President. 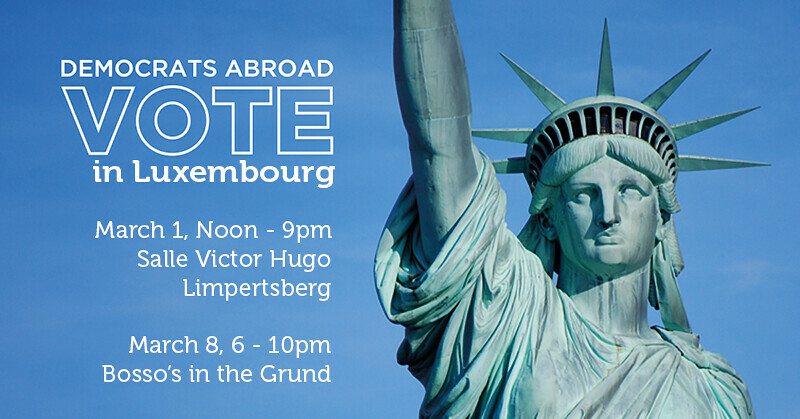 Democrats Abroad Luxembourg will help Americans citizens living abroad to nominate the U.S. Democratic Party’s Presidential nominee through the Global Presidential Primary. Come to one of our Voting Centers on March 1 or March 8 and cast your ballot!